Whilst 2011 was the year for cupcakes with macaroons creeping up on the inside, 2012 is most definitely going to be the year for Cake Pops. Everywhere I look at the moment, people are making cake pops – cute novelty cakes on a stick. And I have no clue where to start. So it was great to see that I’m not the only one to notice the rise of the Cake Pop, as Sweet Treats, the makers of all types of makers, have released a Cake Pops Maker, just in time for the festive season. The Cake Pops would make great gifts for your friends – or even colleagues at work. Make them look pretty in a bag with some ribbon and you’re sorted. They’re also great fun to decorate with the kids. I can see my little monster having a whale of a time, albeit making the mother of all messes. So I think The Sweet Treats maker is a great addition to the gift guide – not that I’m hinting or anything! 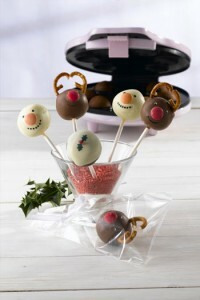 The Cake Pops Maker is available for £24.99 at Lakeland, Argos and all the usual kitchen stores. This entry was posted in food, Gifts, kitchen gadgets and tagged cake pops, kitchen gadget, Sweet treats. Bookmark the permalink.